Unlike its tonier Fairmont brethren, Jasper Park Lodge personifies traditional camp style; rustic woods, fieldstone fireplaces, and ginghams galore reflect its wild side. Each glorious sunrise at Jasper Park Lodge brings with it the promise of new wonders—soaring peaks reflected in the tranquil waters of emerald Lac Beauvert; caribou emerging from the morning mist; ducks diving alongside your kayak as you silently ply the waters on your early morning paddle. This legacy of rustic pleasures began in 1915 when the "resort" consisted of a few lakeshore tents; its rugged personality remains today. The celebrated Lodge exists to give grand, year-round access to the vast mountain playground surrounding it. 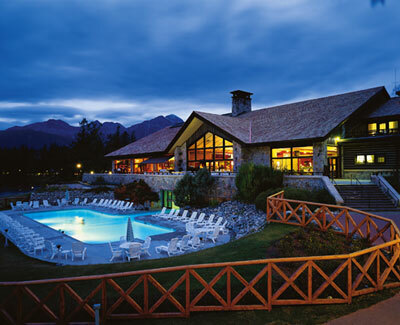 With nearly 500 rooms and cabins decked out in comfortable, log-cabin chic, nine restaurants and bars, a spa, and a premier golf course, Jasper Park offers much more than just a wealth of accommodation and dining options. Charming rooms, spacious suites, and magnificent private cabins create an unforgettable rendezvous for everything from honeymoons to weddings, and family vacations to executive retreats. Be on the lookout for wildlife (elk and bear sightings occur frequently) from one of the many hiking trails around the lake. Head off for a day of downhill skiing on the trails and open bowl of nearby Marmot Basin. Or, if you're looking for a loftier adventure, arrange for a day of heli-skiing on some of the best powder in the Rockies. Whichever you choose, you'll take comfort in knowing you'll have brandy by the fire, or cocktails on a cool, summer-evening terrace, to return to.